Q: Can I add my own custom annotation tools to Qoppa PDF component’s toolbar? A: Yes. 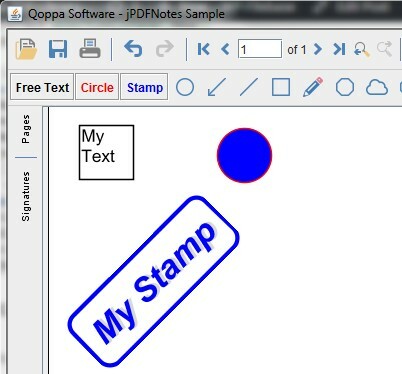 Qoppa PDF components jPDFNotes and jPDFEditor are fully customizable including the Annotation Toolbar. You can remove any existing tools / buttons from the annotation toolbar and add your own buttons for your own tools. This applies to jPDFNotes and jPDFEditor. This sample code shows how to create custom buttoms and add then to the toolbar. This is done in the actionPerformed() method, called when the custom buttons are clicked. Download full java sample code, showing how to add the component to a frame, add the custom annotation tools and launch the frame.